Synopsis : Information and facts on human teeth and cosmetic dentistry including dental implants, crowns, and bridges. Human teeth are classified as incisors, canines, and molars Humans usually have 20 primary teeth (also called deciduous, baby, or milk teeth) and 32 permanent teeth. Among primary teeth, 10 are found in the (upper) maxilla and the other 10 in the (lower) mandible. In the primary set of teeth, there are two types of incisors, centrals and laterals, and two types of molars, first and second. All primary teeth are replaced with permanent counterparts except for molars, which are replaced by permanent premolars. Among permanent teeth, 16 are found in the maxilla with the other 16 in the mandible. Canines - Your four canines are the next type of teeth to develop. These are your sharpest teeth and are used for ripping and tearing food apart. Primary canines generally appear between 16 and 20 months of age with the upper canines coming in just ahead of the lower canines. In permanent teeth, the order is reversed. Lower canines erupt around age 9 with the uppers arriving between 11 and 12 years of age. Incisors - Incisors are the eight teeth in the front and center of your mouth (four on top and four on bottom). These are the teeth that you use to take bites of your food. Incisors are usually the first teeth to erupt, at around 6 months of age for your first set of teeth, and between 6 and 8 years of age for your adult set. Premolars - Premolars, or bicuspids, are used for chewing and grinding food. You have four premolars on each side of your mouth, two on the upper and two on the lower jaw. The first premolars appear around age 10 and the second premolars arrive about a year later. Molars - Primary molars are also used for chewing and grinding food. These appear between 12 and 15 months of age. These molars, also known as deciduous molars, are replaced by the first and second permanent premolars (four upper and four lower). The permanent molars do not replace, but come in behind the primary teeth. The first molars erupt around 6 years of age (before the primary molars fall out) while the second molars come in between 11 and 13 years of age. Third molars - These are the last teeth to develop and do not typically erupt until age 18 to 20, and some people never develop third molars at all. For those who do, these molars may cause crowding and need to be removed. Third molars are commonly called "wisdom teeth" If any additional teeth form, for example, fourth and fifth molars, which are rare, they are referred to as supernumerary teeth. See your dentist or oral health professional regularly. Brush your teeth every day with a fluoride toothpaste. Chewing gum assists oral irrigation between and around the teeth, cleaning and removing particles, but for teeth in poor condition it may damage or remove loose fillings as well. Chewing sugar free chewing gum that contains xylitol may be good for teeth. Dental chewing gums claim to improve dental health. Sugar-free chewing gum stimulates saliva production, and helps to clean the surface of the teeth. fig 1. 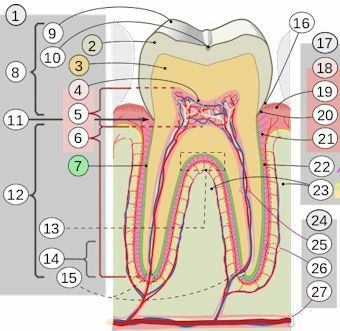 Labeled diagram of a human tooth. 1. Tooth - The complete tooth. 2. Enamel - The hardest and most highly mineralized substance of the body and is one of the four major tissues which make up the tooth, along with dentin, cementum, and dental pulp. 3. Dentin - The substance between enamel or cementum and the pulp chamber. It is secreted by the odontoblasts of the dental pulp. 4. Dental pulp - The central part of the tooth filled with soft connective tissue. This tissue contains blood vessels and nerves that enter the tooth from a hole at the apex of the root. 5. Cameral pulp - The pulp contains blood vessels, nerves, and connective tissue and creates the surrounding hard tissue of the tooth during development. The pulp extends from the crown of the tooth to the tip of the roots where it connects to the tissues surrounding the root. 6. Root pulp - Root/pulp canals refer to the part of the pulp chamber present inside the root of the tooth. 7. Cementum - A specialized bony substance covering the root of a tooth. It is approximately 45% inorganic material (mainly hydroxyapatite), 33% organic material (mainly collagen) and 22% water. Cementum is excreted by cementoblasts within the root of the tooth and is thickest at the root apex. 8. Crown - In dentistry, crown refers to the anatomical area of teeth, usually covered by enamel. 9. Cusp - A cusp is an occlusal or incisal eminence on a tooth. Canine teeth, otherwise known as cuspids, each possess a single cusp, while premolars, otherwise known as bicuspids, possess two each. Molars normally possess either four or five cusps. 10. Sulcus - The atomic term for a specific area of the gums called as sulcus. This is an area where the gum tissue is not connected to the tooth but is usually tightly attached to it. This gum attachment - sulcus - continuously produces a secretion known as sulcus film, which provides a protective covering on the tooth enamel and reduces the risk of cavities in the area where the enamel meets the tooth root. 11. Neck -The narrowed part of a tooth between the crown and the root - also known as cervix dentis and collum dentis. 12. Root - Much as a tree's roots help anchor it in the ground, a tooth's roots anchor it in the jawbone. This allows teeth to withstand the force of biting and chewing food on a daily basis. 13. Furcation - A furcation defect is bone loss, usually a result of periodontal disease, affecting the base of the root trunk of a tooth where two or more roots meet (bifurcation or trifurcation). 14. Root apex - The most prevalent location of the tooth root apex and the major foramen is in the center followed by the distal position. 15. Apical foramen - The apical foramen is the opening at the apex of the root of a tooth, through which the nerve and blood vessels that supply the dental pulp pass. 16. Gingival sulcus - The gingival sulcus is an area of potential space between a tooth and the surrounding gingival tissue and is lined by sulcular epithelium. 17. Periodontium - The periodontium is the specialized tissues that both surround and support the teeth, maintaining them in the maxillary and mandibular bones. 18. Gingiva - ("gums") is the mucosal tissue that overlays the jaws. There are three different types of epithelium associated with the gingiva: gingival, junctional, and sulcular epithelium. These three types form from a mass of epithelial cells known as the epithelial cuff between the tooth and the mouth. 19. Free or interdental - The area between teeth. 20. Marginal - The marginal ridge is a strip of enamel that on anterior (front) teeth is on the tongue facing side, varying in length, and coming together in an almost U of V shape. On posterior teeth it forms the border of the back and front of the tooth when viewed from the biting surface. 21. Alveolar bone - The alveolar bone is the bone of the jaw which forms the alveolus around teeth. 22. Periodontal ligament - Made up of thousands of fibers which fasten the cementum to the bony socket. These fibers anchor a tooth to the jaw bone and act as shock absorbers for the tooth which is subjected to heavy forces during chewing. 23. Alveolar bone - The alveolar process or alveolar bone is the thickened ridge of bone that contains the tooth sockets (dental alveoli) on the jaw bones that hold teeth. In humans, the tooth-bearing bones are the maxilla and the mandible. 24. Vessels and nerves - Each tooth and periodontal ligament has a nerve supply and the teeth are sensitive to a wide variety of stimuli. The blood supply is necessary to maintain the vitality of the tooth. 25. Dental pulp - The dental pulp is the central part of the tooth filled with soft connective tissue. The pulp is commonly called "the nerve" of the tooth. This tissue contains blood vessels and nerves that enter the tooth from a hole at the apex of the root. Other cells in the pulp include fibroblasts, preodontoblasts, macrophages and T lymphocytes. 26. Periodontal - "Perio" means around, and "dontal" refers to teeth. Periodontal diseases are infections of the structures around the teeth, which include the gums, periodontal ligament and alveolar bone. In the earliest stage of periodontal disease — gingivitis — the infection affects the gums. In more severe forms of the disease, all of the tissues are involved. 27. Alveolar through channel - The alveolar process sits on the bone below the apex (or end) of the root of the tooth, called the basal bone. The basal bone is made of the same bone-producing cells in your body and has a greater density than the alveolar bone, which helps it protect vital structures in your mouth, like nerves, arteries and the sinus. The process by which an infant's teeth sequentially appear by breaking through the gums. Teething may start as early as three months or as late, in some cases, as twelve months. Occasionally a baby may even have one or more teeth at birth. The typical time frame for new teeth to appear is somewhere between six and nine months. Plaque - A biofilm consisting of large quantities of various bacteria that form on teeth. If not removed regularly, plaque buildup can lead to dental cavities (caries) or periodontal problems such as gingivitis. Given time, plaque can mineralize along the gingiva, forming tartar. Dental carie - Also described as "tooth decay" or "dental cavities", is an infectious disease which damages the structures of teeth. The disease can lead to pain, tooth loss, infection, and, in severe cases, death. In the United States, dental caries is the most common chronic childhood disease, being at least five times more common than asthma. Cosmetic dentistry is very popular today because people the world over are realizing that they can change the way they look and feel relatively easily with the help of a cosmetic dentist. If you were born with unattractive teeth, if they are suffering the affects of aging, or if stress and bad dental care has finally caught up with you, a cosmetic dentist can help turn back the clock with a variety of dental procedures. When a tooth is lost, dentures, bridges, or implants may be used as replacements. Dentures are usually the least costly whereas implants are usually the most expensive. Dentures may replace complete arches of the mouth or only a partial number of teeth. Bridges replace smaller spaces of missing teeth and use adjacent teeth to support the restoration. Dental implants may be used to replace a single tooth or a series of teeth. Though implants are the most expensive treatment option, they are often the most desirable restoration because of their aesthetics and function. Discoloration of teeth may result from bacteria stains, tobacco, tea, coffee stains on teeth, foods with an abundance of chlorophyll, restorative materials, and medications. Stains from bacteria may cause colors varying from green to black to orange. Green stains also result from foods with chlorophyll or excessive exposure to copper or nickel. Amalgam, a common dental restorative material, may turn adjacent areas of teeth black or gray. Amelogenesis imperfecta - A condition in which enamel does not form properly or at all. Dentinogenesis imperfecta - A condition in which dentin does not form properly and is sometimes associated with osteogenesis imperfecta. Dentin dysplasia - A disorder in which the roots and pulp of teeth may be affected. Regional odontodysplasia - A disorder affecting enamel, dentin, and pulp and causes the teeth to appear "ghostly" on radiographs. Microdontia - A condition where teeth are smaller than the usual size. Macrodontia - When teeth are larger than the usual size. Anodontia - The total lack of tooth development. Hyperdontia - The presence of a higher-than-normal number of teeth. Oligodontia - May be used to describe the absence of 6 or more teeth. Fusion of two deciduous teeth. Gemination - Occurs when a developing tooth incompletely splits into the formation of two teeth. Fusion - The union of two adjacent teeth during development. Concrescence - The fusion of two separate teeth only in their cementum. Accessory cusps - Additional cusps on a tooth and may manifest as a Talon cusp, Cusp of Carabelli, or Dens evaginatus. Dens invaginatus, also called Dens in dente - A deep invagination in a tooth causing the appearance of a tooth within a tooth. Ectopic enamel - Enamel found in an unusual location, such as the root of a tooth. Taurodontism - A condition where the body of the tooth and pulp chamber is enlarged. Hypercementosis - Excessive formation of cementum, which may result from trauma, inflammation, acromegaly, rheumatic fever, and Paget's disease of bone. Dilaceration - A bend in the root which may have been caused by trauma to the tooth during formation. Supernumerary roots - The presence of a greater number of roots on a tooth than expected. Worldwide, 60-90% of school children and nearly 100% of adults have dental cavities. Severe periodontal (gum) disease, which may result in tooth loss, is found in 15-20% of middle-aged (35-44 years) adults. EPA Rejects Anti-Fluoridation Group's Request - ADA commends the Environmental Protection Agency for its decision to deny request to ban community water fluoridation. Dental Work: When to Use Antibiotic Prophylaxis - For some people the use of antibiotic prophylaxis may be recommended by your dentist to prevent infection. Dental Care for Baby Teeth is Very Important - Countering common mis-perception that dental care for baby teeth is not important because they fall out anyway. Strawberries and Baking Soda not the Answer for Teeth Whitening - Research shows strawberry and baking soda formula produces no teeth whitening effect, other than removing plaque accumulation. Free Dental for Children with Autism Spectrum Disorder (ASD) - Free dental services for students with ASD at NSU Baudhuin Preschool at Mailman Segal Center for Human Development. Citation: Disabled World. (2019/03/31). Dental: Teeth Facts and Information. Retrieved 2019-04-22, from https://www.disabled-world.com/health/oral/dental/ Direct Link: Dental: Teeth Facts and Information - Information and facts on human teeth and cosmetic dentistry including dental implants, crowns, and bridges.